ROUND ROCK, Texas - Austin Elite Rugby, in conjunction with the Round Rock Express, announced at a press conference today that it will play six of its 2019 Major League Rugby (MLR) home games at the iconic Dell Diamond. Located at 3400 East Palm Valley Blvd., the iconic 13,000-capacity Dell Diamond is home of the Round Rock Express, the Triple-A affiliate of the Houston Astros. Dell Diamond is built on 85 acres and features a championship grass pitch which has been converted to a rugby field for the 2019 season. Spectator amenities include upgraded seating, superior food and beverage offerings, hospitality suites and plenty of parking. 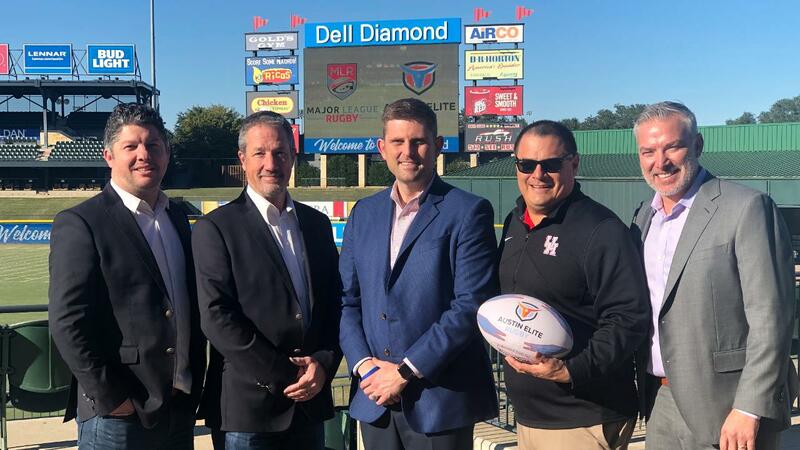 "We are excited to kick-off our second Major League Rugby season at Dell Diamond," commented Richard Osborn President/Owner Austin Elite Rugby. "The support during our first season was incredible and we look forward to entertaining the Central Texas region during the 2019 season." The 2019 Major League Rugby season kicks off the weekend of January 26 against the Houston SaberCats and will span 19 weeks, with Austin Elite Rugby playing six home games at Dell Diamond in the City of Round Rock and the remaining two games in venues to be announced. "We are excited to welcome Austin Elite Rugby to Dell Diamond," Round Rock Express General Manager Tim Jackson said. "We are confident that Austin Elite Rugby players and fans will enjoy the world-class amenities that Dell Diamond and the City of Round Rock have to offer." Rugby is the fastest growing sport in the U.S. with more than 40 million fans nationwide. Texas is home to two MLR teams and nine collegiate teams, with three D1 teams in Central Texas. Two international rugby matches were played at Dell Diamond as part of the America's Rugby Championship in 2016 and 2017, with the venue playing host to the USA Eagles national team. Season Tickets, Intel Club Season Tickets and Captains Club tickets will be available online beginning Tuesday, November 20 at austineliterugby.com/tickets, along with the complete 2019 schedule and official team merchandise. For suite hire, please contact Aschley Eschenburg at Dell Diamond by phone at 512.238.2221 or by email at aschley@rrexpress.com.